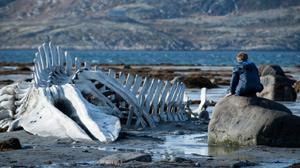 Leviathan is one bitter pill of a movie, but it’s definitely worth swallowing. Director Andrey Zvyagintsev (The Return, Elena) underscores the woes of a Russian society that’s mired in corruption, greed and betrayal as he probes the darker corners of human nature. Zvyagintsev sets his story in the vodka-soaked environs of a small fishing village in northwest Russia, the sort of backwater that seldom sees a tourist. The landscapes are rocky and imposing. This somewhat forlorn town on the Barents coast is home to Kolya (Aleksey Serebryakov), a hardy mechanic who repairs the villagers’ cars. Kolya lives with his attractive wife Lilya (Elena Lyadova) and his teen-age son from a previous marriage (Sergey Pokhodaev). Lilya works at a local fishery, putting in hardscrabble days on an assembly line where fish are gutted. Under the best of circumstances, life for Kolya and Lilya would be far from blissful, and they’re hardly living through the best of circumstances. The mayor of the town (Roman Madyanov) is using his power to try to take over the home that has been in Kolya’s family for years. Kolya resists the mayor’s rapacious onslaught, receiving help from an old army pal (Vladimir Vdovichenkov), an attorney who shows up for a visit. If Leviathan were a Frank Capra movie, the attorney would stand up for the little guy and the corrupt politician would be sent packing. But Zvyagintsev takes us into a world that’s more Putin than Capra. That means you shouldn’t expect Kolya to emerge triumphant, even when his buddy seems to have gotten the upper hand by threatening to expose an unsavory part of the mayor’s past. Leviathan, which recently lost out in its Oscar bid for best foreign-language film, lacks the formal rigor of Ida, the Polish winner in that category. But the film is every bit as deep, and it spares no institution, including the Russian Orthodox church. Everything in the town seems to have been corrupted, a point that’s driven home when some of the locals gather for a picnic at which bullets are fired at portraits of former Soviet leaders such as Brezhnev and Andropov. The villagers may be rejecting the Soviet past, but they have no vision of the future, perhaps because they have no moral compass to guide them toward it. They’re all adrift, scrambling to survive. It should be clear by now that Leviathan is not happily-ever-after, escapist fare. It hardly qualifies as a spoiler to tell you that its characters, particularly Lilya, are not headed for greener pastures. The movie’s title derives from Thomas Hobbes’ 17th century musings on man and government and from a massive beast that has washed ashore and has been rotting away so long, its mammoth skeleton has been exposed. Symbolic readings definitely are encouraged. After seeing Leviathan, you may wonder whether the profound spiritual yearnings of the Russian soul have been taken over by more venal concerns. If so, no one seems better off for it. Leviathan isn’t devoid of comic touches, but it’s a serious and important work from an artist who’s unwilling to ignore the hard truths that drive his often powerless characters deep into the vodka bottle — or worse.